Bioroids and Bombots: Modular Battlesuits. Battlesuits and similar protection are usually depicted as being of a single thick layer. There are a number of reasons why this may not be the likely construction. A battlesuit would in fact be several concentric suits. The innermost layer would probably be some form of environment suit. The exact nature will depend on the usage of the suit. On Earth the environmental layer will be sufficient to protect the wearer from hazards such as chemical and biological weapons or extremes of temperature. The air supply will mainly be filtered from the surrounding atmosphere, with a small oxygen supply for use in thick smock or underwater. The air intake may include a snorkel fitting. For use in space the environmental layer will be much more sophisticated. Suits for the various other planets and moons will vary depending on local conditions. Battlesuits for extended underwater use obviously include a diving suit. Over the environmental suit will be the exoskeleton, responsible for removing the weight of the entire system. This will most likely be constructed as a framework and designed for easy removal and replacement in the event of damage or malfunction. The exoskeleton is a relatively low bulk item and could be designed for compact packing. The resulting package would probably be the size of a large briefcase or small suitcase. This would allow military or expedition vehicles to carry a number of spares. In a previous blog I considered the concept of battlesuits moving when unoccupied. It is possible the spare exoskeleton might come to you! Outermost will be the protective layer and this may be much more like a suit of medieval plate armour than is usually depicted. 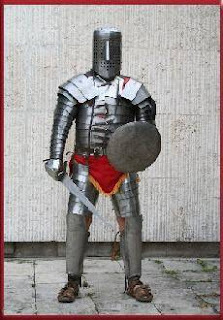 The components of the armour are designed to be easily replaced when damaged. Many components are ambidextrous and can be used on either the left or right side. Many components are modular and multipurpose and can be used in several locations on the armour. The plates are simple to manufacture and replacing one is a relatively simple task. Inventive individuals may come up with novel uses for spare plates. Designing an armour with as few different components as possible will be an interesting challenge. I think the Roman lorica segmantata and manica are worth looking at for inspiration. They even made full suits for Crupellarius. The outer plates are independent of the inner layers of the battlesuit. Damage to a plate will not necessary endanger environmental integrity. An obvious difference from medieval armour is that the plates have a “soft” outer surface. Bullets hitting hard plate often shatter into fragments, injuring other body-parts and damaging vital equipment. Most armour plates have several centimetres of soft material on their surface. This layer may include ablative properties to provide some protection against laser weapons. Plates are usually sprayed with Ablative foam [UT4e p.187] of various camouflaged colours. If a wearer is injured the weight of the armour and exoskeleton can be removed while maintaining the protection of the environmental systems. Alternately the exoskeleton can be locked to allow it to be used like a stretcher.